Thunder guard Russell Westbrook has yet to sign an extension, and whether he plans to stay in Oklahoma City is one of the biggest questions as teams prepare to tip off training camps. But the reigning league MVP said Monday that Oklahoma City is where he wants to be, and he is “happy” about the offseason additions of fellow All-Stars Carmelo Anthony and Paul George. But his unsigned deal has tempered some of the excitement building around the team. Westbrook has until Oct. 16 to ink a contract that would be worth more than $200 million. The guard says he hasn’t signed because of the birth of his son and a busy travel schedule. Westbrook’s former teammate Enes Kanter, who was traded to New York as part of the deal to acquire Anthony, also says he expects Westbrook to sign the deal. Chandler Parsons says he can’t wait to play in a preseason game for the Memphis Grizzlies. It will be the start of what Parson hopes is the end of his playing minutes being restricted and other limitations he’s played under the past three years. Parsons signed a four-year, $94 million contract with Memphis last year, then was limited to a career-low 34 games before being shut down for surgery on his right knee in March. He averaged a career-low 19.9 minutes per games, shot 26.9 percent from 3-point range and averaged just 6.2 points per game. Enes Kanter had dinner with Russell Westbrook the night he learned he was traded. Kanter doesn’t think his former teammate will be following him out of Oklahoma City anytime soon. Kanter said Monday at the Knicks media day that he believes Westbrook will sign a contract extension worth more than $200 million, rather than become a free agent next summer. The new Knicks center says Westbrook told him how much he loves Oklahoma City and how much he sees Oklahoma City like his family. Kanter dined with Westbrook and Thunder center Steven Adams on Saturday after the Thunder agreed to trade him to New York in the deal to acquire Carmelo Anthony. The native of Turkey joked that his former teammates told him to be careful in New York, and to watch out for the media. LeBron James says his intentions to finish his career with Cleveland haven’t changed. The three-time NBA champion, who previously left the Cavaliers as a free agent for Miami, said Monday that he will not make a decision about his future until next summer. The 32-year-old has a player’s option for next season worth $35.6 million. There have been reports swirling around for months about James planning to play for the Los Angeles Lakers next season. James also isn’t taking back calling President Trump “a bum” in a tweet on Saturday after the President pulled back an invitation to the Golden State Warriors to visit the White House. James didn’t back track from his stance against Trump and says he’s further committed to inspiring youth. 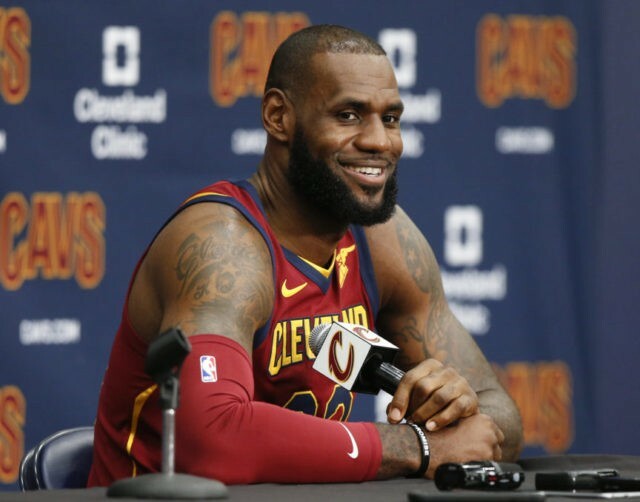 James referred to Trump as “that guy” during a free-wheeling news conference Monday at Cleveland’s media day. Boston Celtics forward Jaylen Brown says he has talked to the rest of the team about protesting President Trump’s comments about athletes. The president complained about football players taking a knee during the national anthem to protest racial inequality and said NFL owners should fire them. The league responded on Sunday with a much wider protest that included condemnations by owners and more than 200 players taking knees during the anthem. Other teams locked arms, sometimes with their owners and coaches. LeBron James says he would love to have Dwyane Wade join the Cavaliers. Wade has accepted a buyout from the Chicago Bulls and Cleveland could be a potential landing spot. James and Wade won two NBA titles together with the Miami Heat and are close friends. James said Monday at the Cavaliers media that he has spoken to Wade, and plans to again. The Carmelo Anthony era in New York is officially over. The Knicks completed their trade with Oklahoma City on Monday morning, sending the All-Star forward to the Thunder for center Enes Kanter, forward Doug McDermott and Chicago’s 2018 second-round draft pick. Mills announced that the Knicks were donating $100,000 to Anthony’s relief efforts to aid Puerto Rico in its recovery from the recent hurricanes. Anthony also thanked the Knicks and New York in an online essay . Cavaliers point guard Isaiah Thomas has made progress with his hip injury, and officials said Monday the organization expects him to play by January. Thomas has begun running and doing on-court activities as he rehabilitates the injury, which prematurely ended his 2017 postseason with the Boston Celtics. The Cavs acquired Thomas this summer from Boston in a blockbuster trade for All-Star point guard Kyrie Irving. Thomas doesn’t need surgery and the Cavs are confident he will be back on the floor in games by the end of the calendar year. While the Eastern Conference champions have been encouraged by Thomas’ recovery, they will not rush him back. Thomas averaged 28.9 points last season for the Celtics, who sent him along with forward Jae Crowder, center Ante Zizic and a 2018 first-round draft to Cleveland for Irving. Cleveland was concerned with Thomas’ injury and the Celtics added a second-round pick to complete the deal. The Miami Heat aren’t sure if they are going to Mexico City for a game this season. The Heat are scheduled to play the Brooklyn Nets on Dec. 9 in Mexico City, a city where at least 186 people died in a massive earthquake last week. Rescuers were still digging in dangerous piles of rubble Monday, desperately seeking any more survivors. Heat coach Erik Spoelstra says the team sent personnel to Mexico City to see the arena before the quake, and will send people back to Mexico City in the coming weeks. Across Mexico, at least 324 people died in the quake. The NBA has said that, for now at least, the game remains as scheduled. Politics is already the talk of NBA media day. After a weekend where President Donald Trump rescinded the Golden State Warriors’ invitation to the White House and Cleveland star LeBron James responded by calling the president a “bum,” it was clear that Monday’s season-opening media sessions for 28 teams were quite possibly going to be as much about politics as basketball. Detroit Pistons owner Tom Gores released a statement early Monday that did not specifically mention Trump, but says “America’s most treasured values include equality and diversity, and the right to effect change through peaceful expression and thoughtful debate.” Gores also says he will support the Pistons players and their right to thoughtfully raise awareness to various causes. The most retweeted post ever sent by LeBron James before this weekend was one in 2013 in response to the incessant who’s-better debate about him and Michael Jordan. “I’m not MJ, I’m LJ,” he wrote. It was retweeted nearly 112,000 times. And then LJ took on POTUS, calling President Donald Trump a “bum.” James’ Twitter account exploded from there, the 640,000 and counting retweets making it one of the top 15 shared posts ever. If James’ tweet is any indicator, politics will be center stage across the NBA on Monday when 28 teams gather for their media days — the annual precursor to the start of training camps. Carmelo Anthony will formally become part of the Oklahoma City Thunder on Monday, Kyrie Irving’s first season in Boston will truly begin and Dwyane Wade is about to become a free agent after reaching a buyout with Chicago.